On New Year's Eve 2001, with her husband by her side, Phillipa McGuinness buried her son. They stood with a young priest in Chua Chu Kang Cemetery and watched a small coffin go into the ground. Later that night, shattered, they sat looking out at the hundreds of ships waiting to come into port in Singapore's harbor. Or trying to leave, who could tell? Each of them thinking about the next year, starting within hours. Phillipa wanted time to push on, for 2001 to be over, but she was also scared. What might be next? 2001 was an awful year. It's the only year where you can mention a day and a month using only numbers and everyone knows what you mean. But 9/11 wasn't the only momentous event that year. In Australia a group of orange-jacketed asylum seekers on deck the Norwegian vessel Tampa seemed responsible for Prime Minister John Howard's statement not long after- 'We will decide who comes to this country and the circumstances in which they come.' These words became his mantra during the bruising election that followed in November, both sides of politics affected by their venom and insularity, or their strength and resolve, depending on which way you looked at it. The year had started with what was supposed to be a celebratory event of sophistication and nuance, reflecting the kind of country we hoped we had become. Yet the Centenary of Federation on 1 January turned out to be a class-A fizzer. The nation seemed to decide that what was really worth commemorating wasn't the peaceful bringing together of colonial states into a Commonwealth but the doomed assault on a Turkish beach that happened fourteen years later in 1915. It is easier to animate young men dying than old men signing a constitution. If 2001 were a movie - oh wait, of course it was - its tagline might be 'The year that changed everything'. And that change is not over. 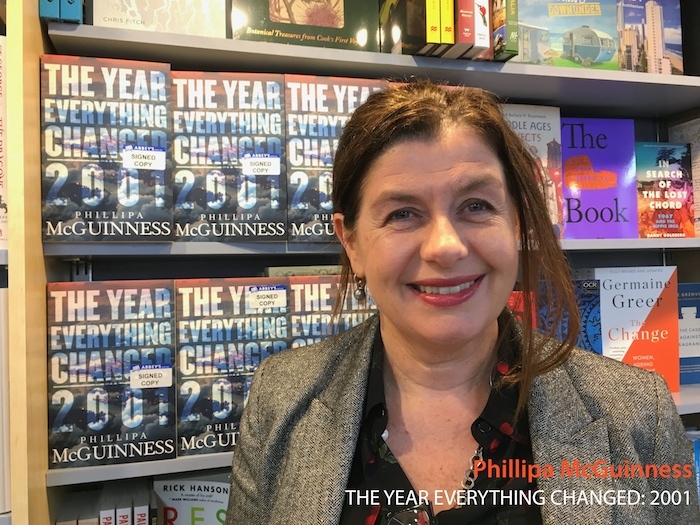 Phillipa McGuinness has worked in book publishing for almost 25 years, first at Cambridge University Press and for the past decade at NewSouth Publishing, where she is executive publisher. A leading non-fiction publisher, she has published many prize-winning books of history, current affairs, biography and memoir. She conceived and commissioned the acclaimed 'city' series, which includes books by Delia Falconer, Sophie Cunningham, Matthew Condon and Kerryn Goldsworthy. She is the editor of Copyfight, published in 2015, for which she wrote a substantial introduction. She was the keynote speaker at the ANZCA conference in July 2016.She has appeared on panels, and as a chair, at writer's festivals (Sydney, Melbourne, Newcastle), publishing seminars, and media and journalism conferences such as the Walkley Foundation's Storyology. She has talked about culture, copyright and cities on various ABC radio programs, including Geraldine Doogue's Saturday Extra, Books and Writing and Marc Fennell's Download This Show.She tweets at @pipmcg but gets more personal on Facebook.